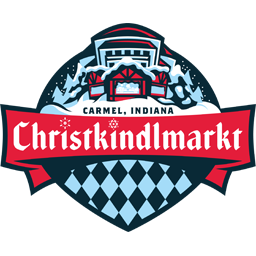 The 2018 Carmel Christkindlmarkt is now CLOSED. The Carmel Christkindlmarkt is bringing the old world charm of Christmas in Germany to beautiful Carmel, Indiana. 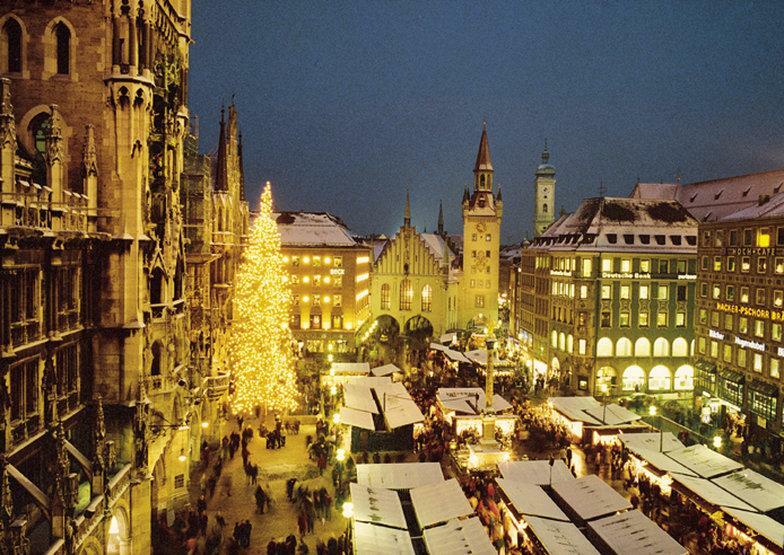 The Christmas market tradition stretches back to Saxony, Germany during the middles ages. Over the centuries, the joys of the traditional Christmas markets spread from town to town, and around the world! 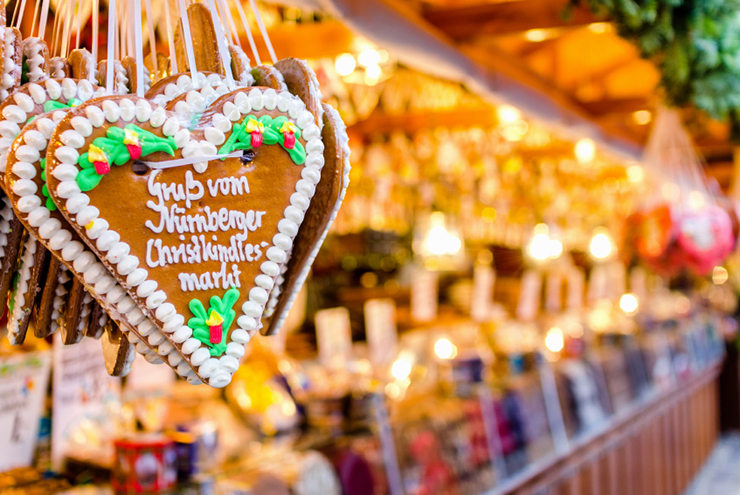 Christkindlmarkt is the German name for the traditional Christmas market, literally translated as "Christ child market." These markets feature a delightful blend of holiday food, drinks, gifts, and decorations. 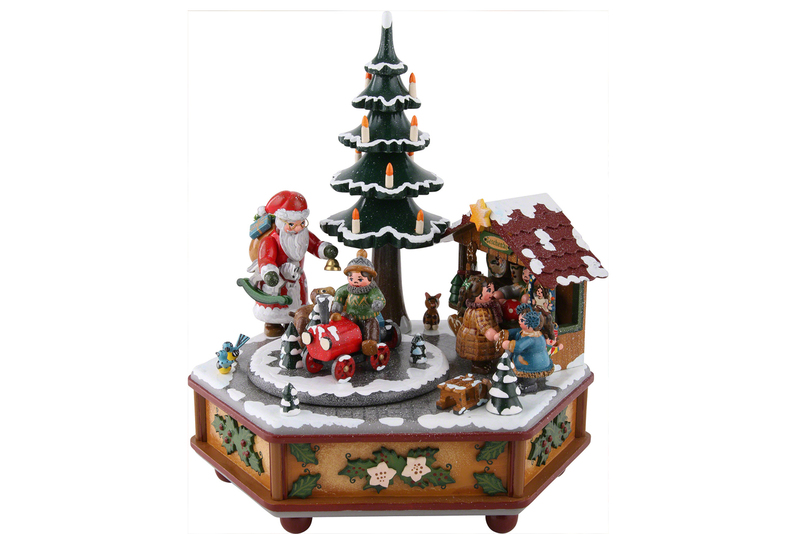 Various regions of Germany became well-known for their hand-crafted Christmas decorations, wood-working, artwork, or textiles. Today, millions of people enjoy Germany's Christmas markets each year. The Carmel Christkindlmarkt will feature a variety of food and drinks enjoyed at German Christmas markets the world over. These are a few of the most traditional Christkindlmarkt items that you'll find at the Carmel Christkindlmarkt. Laugenbrezel is the name for the traditional hand-rolled German pretzel. 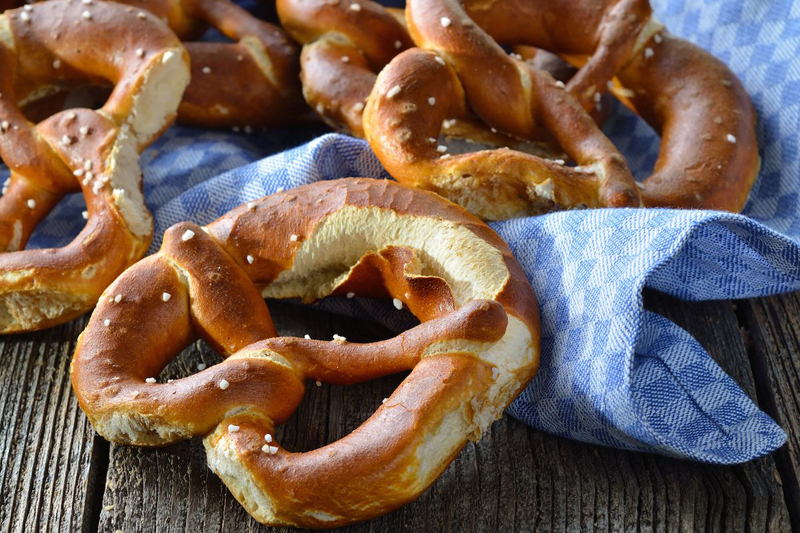 Enjoy these and a variety of Bavarian style pretzels and sandwiches. Wurst is a German specialty sausage and a big part of German cuisine. 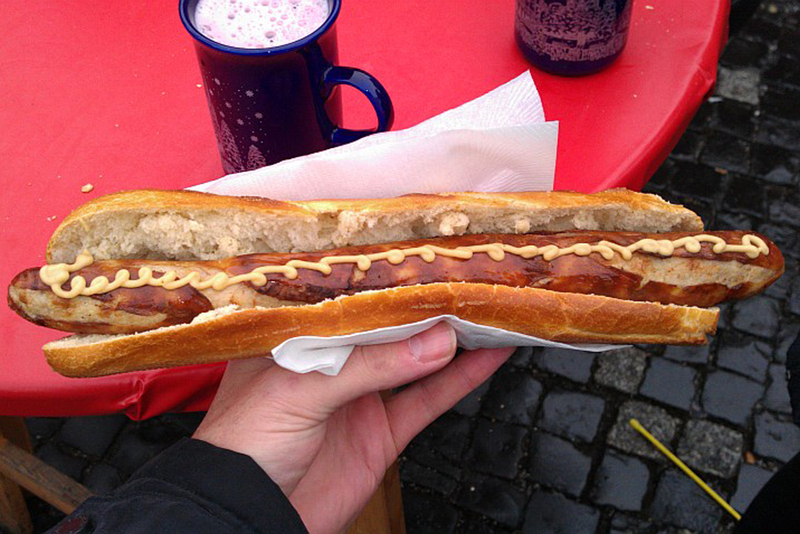 Worldwide, Germany offers the largest selection of wurst with over 1,500 kinds to choose from. 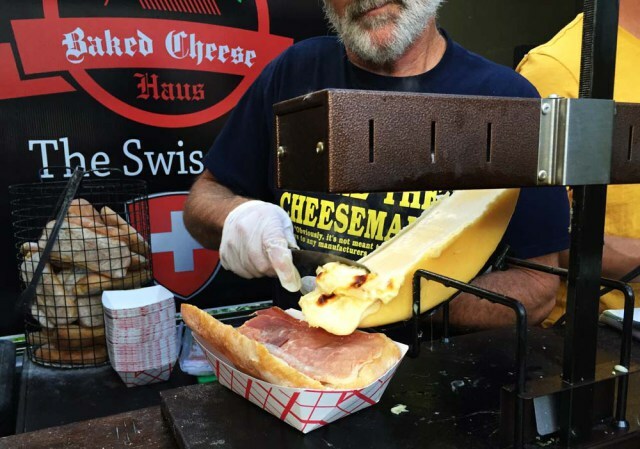 Raclette is a Swiss-German dish dating back centuries. A large wheel of semi-hard cheese is melted and scraped onto plates with bread and charcuterie. Lebkuchen is a traditional German cookie that is usually baked for Christmas. It is most like a soft gingerbread cookie, made with molasses and full of warm spices. 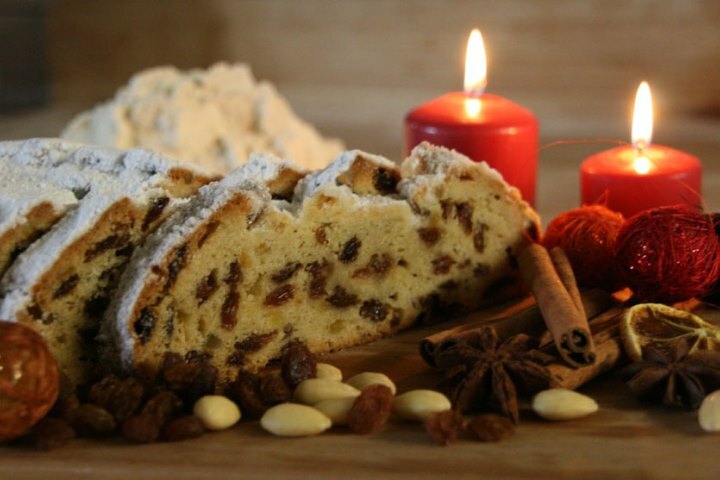 Stollen is a fruit bread containing dried fruit and often covered with powdered sugar or icing sugar. The bread is usually made with chopped candied fruit and/or dried fruit, nuts and spices. Glühwein is homemade German hot mulled wine. It is a traditional beverage that is offered during the Christmas holidays. 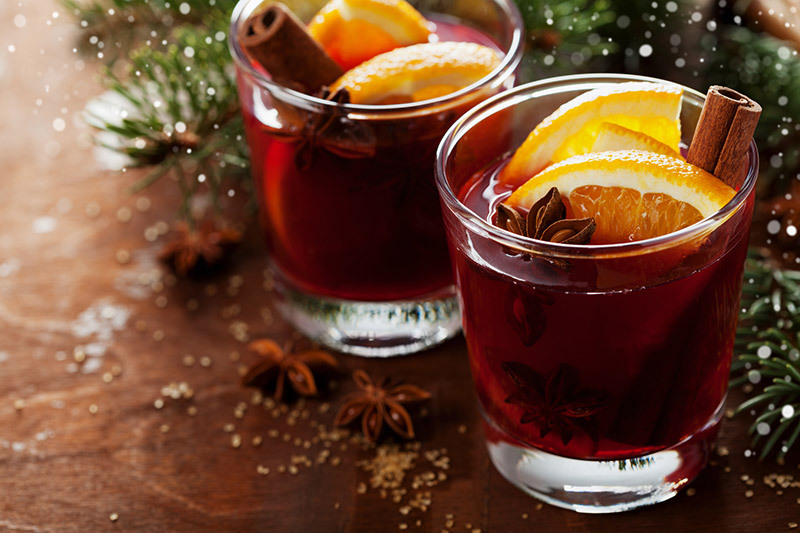 Glühwein is usually prepared from a sweet red wine, heated, and spiced with cinnamon sticks, cloves, star aniseed, citrus, sugar, and vanilla pods. 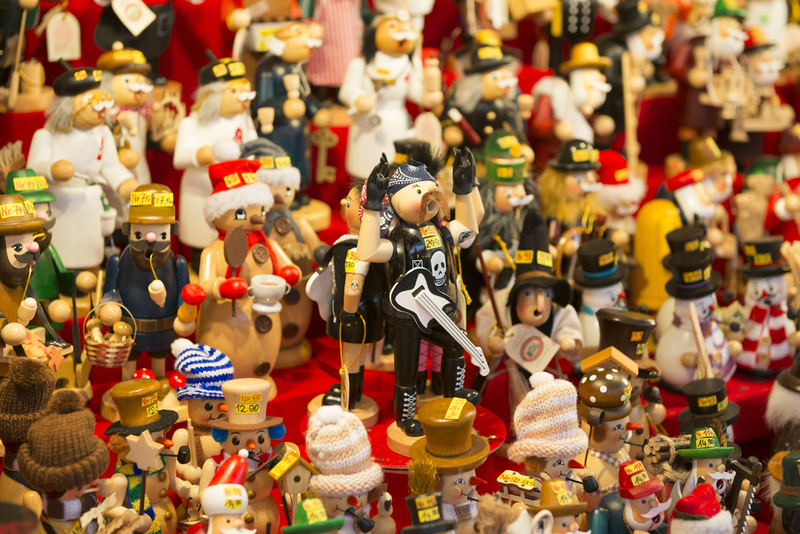 Germany boasts a rich tradition of handmade Christmas goods. From hand carved woodwork to hand painted decorations, the highly cherished artistry and guarded craftsmanship of these unique items have been honed for centuries, passing from one generation to the next. Christmas pyramids, or "Weihnachtspyramide", are Christmas decorations that have their roots in the folklore and customs of the Ore Mountain region of Germany. 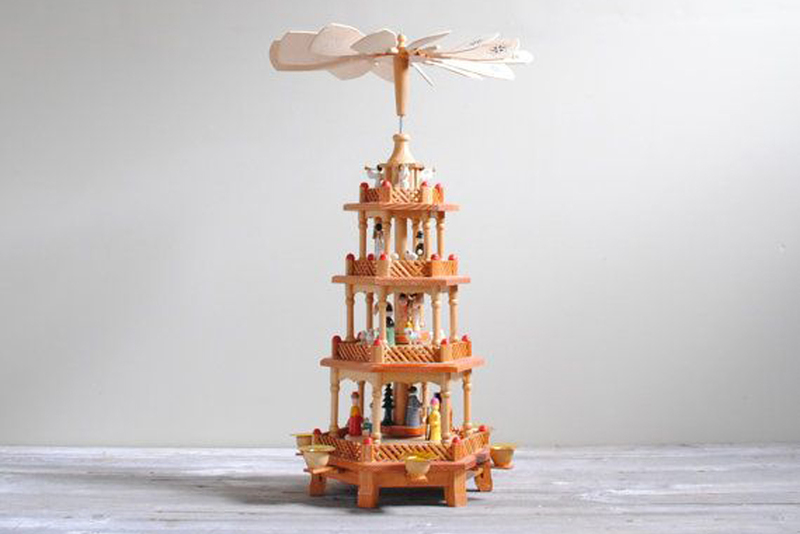 Candles on the bottom tier drive warm air to the top, spinning the carousel. 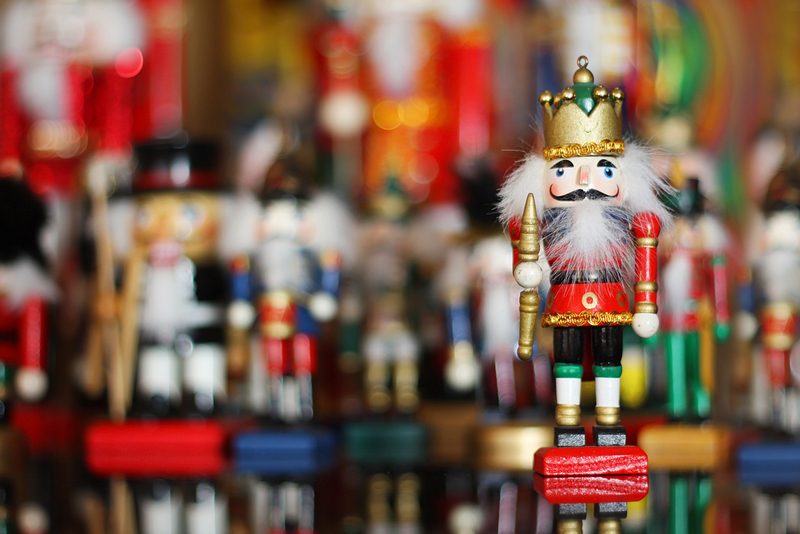 Nutcracker dolls, also known as Christmas nutcrackers, are decorative nutcracker figurines most commonly made to resemble a toy soldier. In German tradition, the dolls are symbols of good luck, scaring away bad spirits. 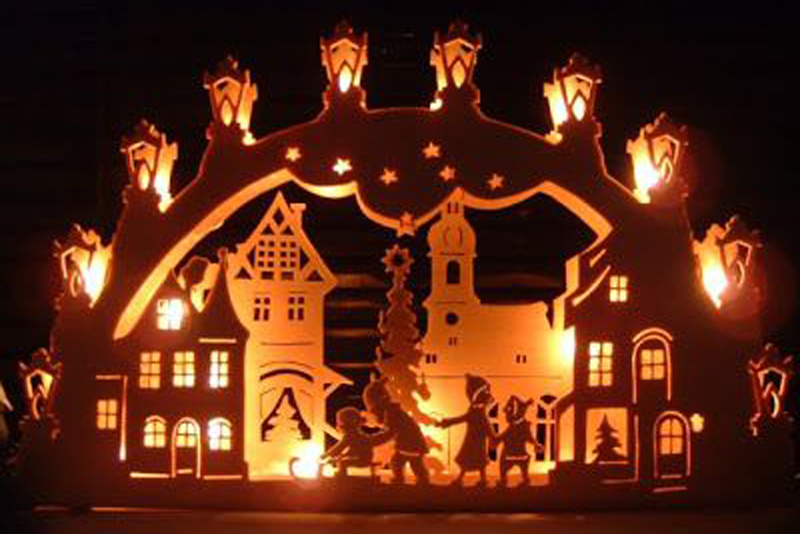 A candle arch, or "Schwibbogen", is a decorative candle-holder from the Ore Mountains region of Saxony, Germany. The early candle arches always consisted of black ore. They were made out of one single forged piece and could be painted. Now, most of these beautiful pieces are intricately carved from wood. The first smoker was developed around 1850 in Heidelberg close to Seiffen. At first dough served as material. Nowadays also Santa Claus and other modern motives are manufactured. Woodturning is the main technique that is used to produce a smoker. 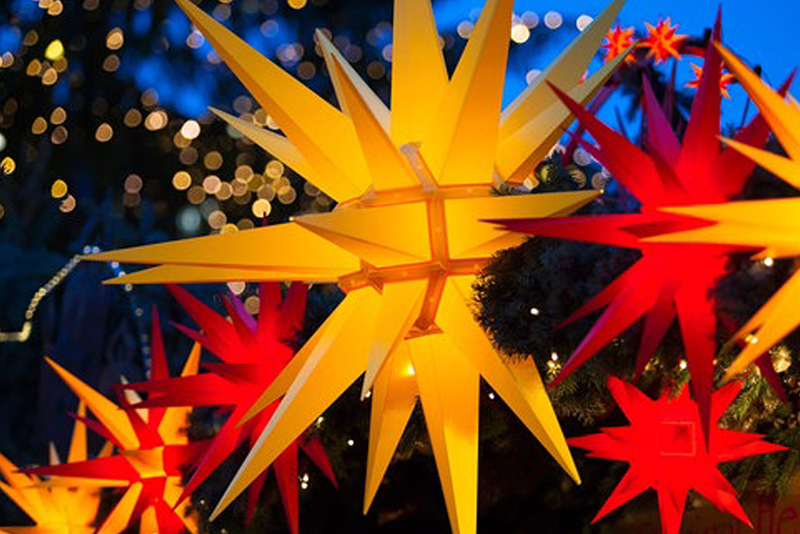 A Moravian star (German: Herrnhuter Stern) is an illuminated Advent, Christmas, or Epiphany decoration popular in Germany and in places in America and Europe where there are Moravian congregations. 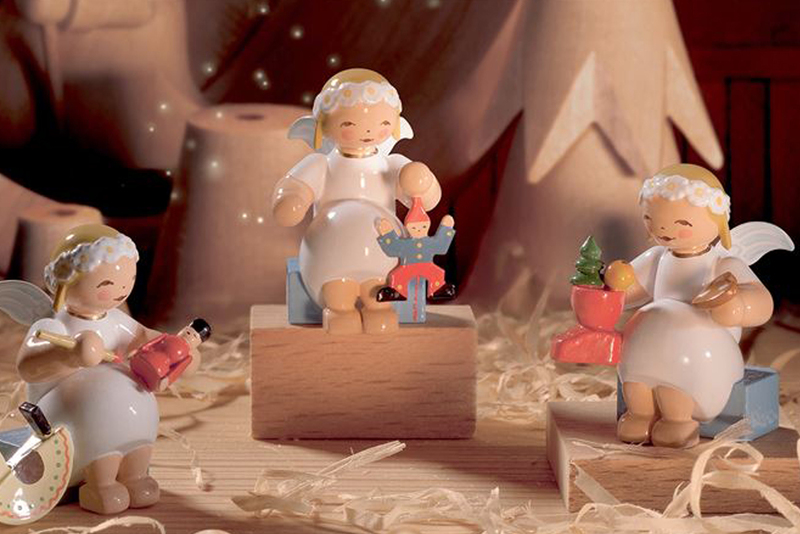 These sweet authentic German holiday figurines are another example of the handmade beautiful wooden craftsmanship available at the Christkindlmarkt. The invention of the Music Box goes back to 18th Century. At first it was a simple toy, which was turned by hand and sounded quite wooden. Around 1930 the Music Box developed into what it is today. Hand carved nativities have been a tradition in Bavaria, Germany for hundreds of years, with the wood carvers of Oberammergau being especially celebrated for their work in the art form. German Christmas ornaments and window hangings have been made for centuries, often as intricate hand carved wooden ornaments or blown glass ornaments with beautifully hand painted scenes and pictures.